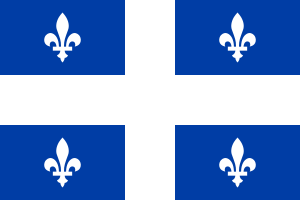 Justifications for Quebec's sovereignty are historically nationalistic in character, claiming the unique culture and French-speaking majority (78% of the provincial population) are threatened with assimilation by either the rest of Canada or, as in Metropolitan France, by Anglophone culture more generally, and that the best way to preserve language, identity and culture is via the creation of an independent political entity. Other distinguishing factors, such as religious differences (given the Catholic majority in Quebec), are also used to justify either separation or ethno-nationalist social policies advocated by the Parti Québécois. The historical justification is that Quebec should be independent by virtue of New France having been conquered by the British in 1763 and subsequently relinquished to the British in exchange for Guadeloupe. It argues that the people of Quebec are the descendants of a conquered people who are due their national sovereignty. This perspective was popular in the 1950s and 1960s when European countries were giving up their colonies in the name of independence throughout much of Africa, the Middle East and South Asia. Eight of the other Canadian provinces are overwhelmingly (greater than 90%) English-speaking, while New Brunswick is officially bilingual and about one-third Francophone. Another rationale is based on resentment of anti-Quebec sentiment. With regard to the creation of the sovereignist movement, language issues were but a sub-stratum of larger cultural, social and political differences. Many scholars point to historical events as framing the cause for ongoing support for sovereignty in Quebec, while more contemporary politicians may point to the aftermath of more recent developments like the Canada Act of 1982, the Meech Lake Accord or the Charlottetown Accord. Tension between the francophone, Catholic population of Quebec and the largely anglophone, Protestant population of the rest of Canada has been a central theme of Canadian history, shaping the early territorial and cultural divisions of the country that persist to this day. Supporters of sovereignty for Quebec believe that the current relationship between Quebec and the rest of Canada does not reflect Quebec's best social, political and economic development interests. Moreover, many subscribe to the notion that without appropriately recognizing that the people of Quebec are culturally distinct, Quebec will remain chronically disadvantaged in favour of the English-Canadian majority. There is also the question of whether the French language can survive within the geographic boundaries of Quebec and where French-Canadian society and culture fits into what is an increasingly multicultural country. Separatists and Independentists are generally opposed to some aspects of the federal system in Canada and do not believe it can be reformed in a way that could satisfy the needs of Quebec's French-speaking majority. A key component in the argument in favour of overt political independence is that new legislation and a new system of governance could best secure the future development of modern Québécois culture. Additionally, there is wide-ranging debate about defence, monetary policy, currency, international-trade and relations after independence and whether a renewed federalism would give political recognition to the Quebec nation (along with the other 'founding' peoples, including Canadian First Nations, the Inuit, and the British) could satisfy the historic disparities between these cultural "nations" and create a more cohesive and egalitarian Canada. Several attempts at reforming the federal system in Canada have thus far failed because of, particularly, the conflicting interests between Quebec's representatives and the other provincial governments' representatives. There is also a degree of resistance throughout Quebec and the rest of Canada to re-opening a constitutional debate, in part because of the nature of these failures—not all of which were the result simply of sovereignists and federalists not getting along. To cite one case, in a recent round of constitutional reform, Elijah Harper, an aboriginal leader from Manitoba, was able to prevent ratification of the agreement in the provincial legislature, arguing that the accord did not address the interests of Canada's aboriginal population. This was a move to recognize that other provinces represent distinct cultural entities, such as the aboriginal population in Canada's Prairies or the people of Newfoundland (which contains significant and culturally distinct French-Canadian, English-Canadian, Irish-Canadian and Aboriginal cultures- and many more). Perhaps the most significant basis of support for Quebec's sovereignty movement lies in more recent political events. For practical purposes, many political pundits use the political career and efforts of René Lévesque as a marker for the beginnings of what is now considered the contemporary movement, although more broadly accepted consensus appears on the contemporary movement finding its origins in a period called the Quiet Revolution. René Lévesque, architect of the first referendum on sovereignty, claimed a willingness to work for change in the Canadian framework after the federalist victory in the referendum of 1980. This approach was dubbed le beau risque ("the beautiful risk"), and it led to many ministers of the Lévesque's government to resign in protest. The 1982 patriation of the Canadian constitution did not solve the issue in the point of view of the majority of sovereignists. The constitutional amendment of 1982 was agreed to by representatives from 9 of the 10 provinces (with René Lévesque abstaining). Nonetheless, the constitution is integral to the political and legal systems used in Quebec. There are numerous possible reasons the 'Yes' campaign went down to defeat: The economy of Quebec suffered measurably following the election of the sovereignist Parti Québécois and continued to during the course of the campaign. The Canadian dollar lost much of its value and, during coverage of the dollar's recovery against US currency, there were repeated citations of the referendum and political instability caused by it cited as cause for the fall. Some suggest there were promises of constitutional reform to address outstanding political issues between the province and the federal government, both before and since, without any sign of particularly greater expectation those promises would be filled to any greater or lesser degree. There remains no conclusive evidence that the sovereignty movement derives significant support today because of anything that was promised back in the 1970s. I also criticized the unilateral repatriation [sic] of 1982, concluding that even in their moments of greatest mistrust, the Québécois never imagined that the pact of 1867 could ever be changed without their consent. Hence the impression they had in 1982 of a breach of trust, of a violation of the national bond's integrity. The descendants of George-Étienne Cartier did not expect this from the descendants of John A. Macdonald. Perceived as trickery in Quebec, the repatriation [sic] of 1982 has placed a time bomb in the political dynamics of this country". For a majority of Quebec politicians, whether sovereignist or not, the problem of Quebec's political status is considered unresolved to this day. Although Quebec independence is a political question, cultural concerns are also at the root of the desire for independence. The central cultural argument of the sovereignists is that only sovereignty can adequately ensure the survival of the French language in North America, allowing Quebecers to establish their nationality, preserve their cultural identity, and keep their collective memory alive (see Language demographics of Quebec). It has been argued by Jeremy Webber and Robert Andrew Young that, as the office is the core of authority in the province, the secession of Quebec from Confederation would first require the abolition or transformation of the post of Lieutenant Governor of Quebec; such an amendment to the constitution of Canada could not be achieved without, according to Section 41 of the Constitution Act, 1982, the approval of the federal parliament and all other provincial legislatures in Canada. Others, such as J. Woehrling, however, have claimed that the legislative process towards Quebec's independence would not require any prior change to the viceregal post. Young also concluded that the lieutenant governor could refuse Royal Assent to a bill that proposed to put an unclear question on sovereignty to referendum or was based on the results of a referendum that asked such a question. In a series of letters throughout the 1990s, Stéphane Dion (the federal Intergovernmental Affairs Minister at the time) laid out an argument against sovereignty. It has also been argued by prominent Quebecers (sovereignists and ex-sovereignists, including former Quebec premier Lucien Bouchard) that sovereignty politics has distracted Quebecers from the real economic problems of Quebec, and that sovereignty by itself cannot solve those problems. In 2005 they published their position statement, "Pour un Québec lucide", ("For a clear vision of Quebec") which details the problems facing Quebec. Many federalists oppose the Quebec sovereignty movement for economic and political reasons but many also oppose sovereignty on other grounds. For example, since the 1995 referendum, in regards to the declaration of Jacques Parizeau who blamed the loss on "money and the ethnic vote", many federalists considered the sovereignty movement as an expression of ethnic nationalism. Some arguments against sovereignty claim that the movement is illegitimate because of its Eurocentrism which alienates many among Canada's First Nations, as well as the Inuit, and Métis peoples and their sympathizers. The sentiment is summed up by a quotation from a Mohawk from Akwsasne: "How can Quebec, with no economic base and no land base, ask to become sovereign? How can Quebec be a nation when they have no constitution? We have had a constitution since before the American revolution." Here the argument expresses the claim that the Mohawk nation has a more legitimate claim to distinct nationhood on the basis of traditional lands and a constitution predating confederation (and the creation of Quebec and a Québécois identity) and thus should be afforded the right of self-determination. Similarly, the Cree have also asserted for many years that they are a separate people with the right to self-determination recognized under international law. They argue that no annexation of them or their territory to an independent Quebec should take place without their consent, and that if Quebec has the right to leave Canada then the Cree people have the right to choose to keep their territory in Canada. Cree arguments generally do not claim the right to secede from Canada; rather, the Cree see themselves as a people bound to Canada by treaty (see the James Bay and Northern Quebec Agreement), and as citizens of Canada. The Cree have stated that a unilateral declaration of independence by Quebec would be a violation of fundamental principles of human rights, democracy and consent. If secession were to proceed, the Cree argue that they would seek protection through the Canadian courts as well as asserting Cree jurisdiction over its people and lands. Professor Peter Russell has said of Aboriginal peoples in Canada: "(they) are not nations that can be yanked out of Canada against their will by a provincial majority.... With few exceptions (they) wish to enjoy their right to self-government within Canada, not within a sovereign Quebec." International human rights expert Erica-Irene Daes says the change "will leave the most marginalized and excluded of all the world's peoples without a legal, peaceful weapon to press for genuine democracy...." This concern is connected to the claim that if Quebec were to be considered its own autonomous nation-state then it need not honour the treaties and agreements that were formed between Aboriginal peoples and the British and French monarchies and is now maintained by the federal Canadian government. Concern for this may stem from perception of neo-colonial or eurocentric attitudes in the leadership of former premiers, such as Robert Bourassa and self-proclaimed "Conqueror of the North". The history of the relations between French and British descendants in Canada has been marked by periodic tension. After colonizing Canada from 1608 onward, France lost it to Great Britain at the conclusion of the Seven Years' War in 1763, in which France ceded control of New France (except for the two small islands of Saint Pierre and Miquelon) to Great Britain, which returned some of France's West Indian islands, in the Treaty of Paris. Under British rule, French Canadians struggled to maintain their culture, notably outside of Quebec (where they became a minority) but within the province as well, as much of the province's economy was dominated by British settlers. The cause of Québécois nationalism, which waxed and waned over two centuries, gained prominence from the 1960s onward. The use of the word "sovereignty" and many of the ideas of this movement originated in the 1967 Mouvement Souveraineté-Association of René Lévesque. This movement ultimately gave birth to the Parti Québécois in 1968. The Parti Québécois defines sovereignty as the power for a state to levy all its taxes, vote on all its laws, and sign all its treaties (as mentioned in the 1980 referendum question). The type of association between an independent Quebec and the rest of Canada was described as a monetary and customs union as well as joint political institutions to administer the relations between the two countries. The main inspiration for this project was the then-emerging European Community. In [[An Option for Quebec|Option Québec]] Lévesque expressly identified the EC as his model for forming a new relationship between sovereign Quebec and the rest of Canada, one that would loosen the political ties while preserving the economic links. The analogy, however, is counterproductive, suggesting Lévesque did not understand the nature and purpose of the European Community nor the relationship between economics and politics that continue to underpin it. Advocates of European integration had, from the outset, seen political union as a desirable and natural consequence of economic integration. Sovereignty-association as originally proposed would have meant that Quebec would become a politically independent state, but would maintain a formal association with Canada — especially regarding economic affairs. It was part of the 1976 sovereignist platform which swept the Parti Québécois into power in that year's provincial elections – and included a promise to hold a referendum on sovereignty-association. René Lévesque developed the idea of sovereignty-association to reduce the fear that an independent Quebec would face tough economic times. In fact, this proposal did result in an increase in support for a sovereign Quebec: polls at the time showed that people were more likely to support independence if Quebec maintained an economic partnership with Canada. This line of politics led the outspoken Yvon Deschamps to proclaim that what Quebecers want is an independent Quebec inside a strong Canada, thereby comparing the sovereignist movement to a spoiled child that has everything it could desire and still wants more. In 1979 the PQ began an aggressive effort to promote sovereignty-association by providing details of how the economic relations with the rest of Canada would include free trade between Canada and Quebec, common tariffs against imports, and a common currency. In addition, joint political institutions would be established to administer these economic arrangements. But the sovereignist cause was hurt by the refusal of many politicians (most notably the premiers of several of the other provinces) to support the idea of negotiations with an independent Quebec, contributing to the Yes side losing by a vote of 60 percent to 40 percent. This loss laid the groundwork for the 1995 referendum, which stated that Quebec should offer a new economic and political partnership to Canada before declaring independence. An English translation of part of the Sovereignty Bill reads, "We, the people of Quebec, declare it our own will to be in full possession of all the powers of a state; to levy all our taxes, to vote on all our laws, to sign all our treaties and to exercise the highest power of all, conceiving, and controlling, by ourselves, our fundamental law." This time, the sovereignists lost in a very close vote: 50.6 percent to 49.4 percent, or only 53,498 votes out of more than 4,700,000 votes cast. However, after the vote many within the sovereignist camp were very upset that the vote broke down heavily along language lines. Approximately 90 percent of English speakers and allophones (mostly immigrants and first-generations Quebecers whose native language is neither French or English) Quebecers voted against the referendum, while almost 60 percent of Francophones voted Yes. Quebec premier Jacques Parizeau, whose government supported sovereignty, attributed the defeat of the resolution to "money and ethnic votes." His opinion caused an outcry among English speaking Quebecers, and he resigned following the referendum. Accusations of an orchestrated effort of 'election engineering' in several polling stations located in areas with large numbers of non-francophone voters, which resulted in unusually large proportions of rejected ballots, were raised following the 1995 referendum. Afterward, testimony by PQ-appointed polling clerks indicated that they were ordered by PQ-appointed overseers to reject ballots in these polling stations for frivolous reasons that were not covered in the election laws. While opponents of sovereignty were pleased with the defeat of the referendum, most recognized[example needed] that there were still deep divides within Quebec and problems with the relationship between Quebec and the rest of the country. The Quiet Revolution in Quebec brought widespread change in the 1960s. Among other changes, support for Quebec independence began to form and grow in some circles. The first organization dedicated to the independence of Quebec was the Alliance Laurentienne, founded by Raymond Barbeau on January 25, 1957. On September 10, 1960, the Rassemblement pour l'indépendance nationale (RIN) was founded, with Pierre Bourgault quickly becoming its leader. On August 9 of the same year, the Action socialiste pour l'indépendance du Québec (ASIQ) was formed by Raoul Roy. The "independence + socialism" project of the ASIQ was a source of political ideas for the Front de libération du Québec (FLQ). On October 31, 1962, the Comité de libération nationale and, in November of the same year, the Réseau de résistance were set up. These two groups were formed by RIN members to organize non-violent but illegal actions, such as vandalism and civil disobedience. The most extremist individuals of these groups left to form the FLQ, which, unlike all the other groups, had made the decision to resort to violence in order to reach its goal of independence for Quebec. Shortly after the November 14, 1962, Quebec general election, RIN member Marcel Chaput founded the short-lived Parti républicain du Québec. In February 1963, the Front de libération du Québec (FLQ) was founded by three Rassemblement pour l'indépendance nationale members who had met each other as part of the Réseau de résistance. They were Georges Schoeters, Raymond Villeneuve, and Gabriel Hudon. In 1964, the RIN became a provincial political party. In 1965, the more conservative Ralliement national (RN) also became a party. During this period, the Estates General of French Canada are organized. The stated objective of these Estates General was to consult the French-Canadian people on their constitutional future. The historical context of the time was a period when many former European colonies, such as Cameroon, Congo, Senegal, Algeria, and Jamaica, were becoming independent. Some advocates of Quebec independence saw Quebec's situation in a similar light; numerous activists were influenced by the writings of Frantz Fanon, Albert Memmi, and Karl Marx. In June 1967, French president Charles de Gaulle, who had granted independence to Algeria, shouted "Vive le Québec libre!" during a speech from the balcony of Montreal's city hall during a state visit to Canada. In doing so, he deeply offended the federal government, and English Canadians felt he had demonstrated contempt for the sacrifice of Canadian soldiers who died on the battlefields of France in two world wars. The visit was cut short and de Gaulle left the country. Finally, in October 1967, former Liberal cabinet minister René Lévesque left that party when it refused to discuss sovereignty at a party convention. Lévesque formed the Mouvement souveraineté-association and set about uniting pro-sovereignty forces. He achieved that goal in October 1968 when the MSA held its only national congress in Quebec City. The RN and MSA agreed to merge to form the Parti Québécois (PQ), and later that month Pierre Bourgault, leader of the RIN, dissolved his party and invited its members to join the PQ. Meanwhile, in 1969 the FLQ stepped up its campaign of violence, which would culminate in what would become known as the October Crisis. The group claimed responsibility for the bombing of the Montreal Stock Exchange, and in 1970 the FLQ kidnapped British Trade Commissioner James Cross and Quebec Labour Minister Pierre Laporte; Laporte was later found murdered. Jacques Parizeau joined the party on September 19, 1969, and Jérôme Proulx of the Union Nationale joined on November 11 of the same year. In the 1970 provincial election, the PQ won its first seven seats in the National Assembly. René Lévesque was defeated in Mont-Royal by the Liberal André Marchand. In the 1976 election, the PQ won 71 seats — a majority in the National Assembly. With voting turnouts high, 41.4 percent of the electorate voted for the PQ. Prior to the election, the PQ renounced its intention to implement sovereignty-association if it won power. On August 26, 1977, the PQ passed two main laws: first, the law on the financing of political parties, which prohibits contributions by corporations and unions and set a limit on individual donations, and second, the Charter of the French Language. On May 17 PQ Member of the National Assembly Robert Burns resigned, telling the press he was convinced that the PQ was going to lose its referendum and fail to be re-elected afterwards. Sovereignty-association was proposed to the population of Quebec in the 1980 Quebec referendum. The proposal was rejected by 60 percent of the Quebec electorate. The PQ was returned to power in the 1981 election with a stronger majority than in 1976, obtaining 49.2 per cent of the vote and winning 80 seats. However, they did not hold a referendum in their second term, and put sovereignty on hold, concentrating on their stated goal of "good government". René Lévesque retired in 1985 (and died in 1987). In the 1985 election under his successor Pierre-Marc Johnson, the PQ was defeated by the Liberal Party. The PQ returned to power in the 1994 election under Jacques Parizeau, this time with 44.75% of the popular vote. In the intervening years, the failures of the Meech Lake Accord and Charlottetown Accord had revived support for sovereignty, which had been written off as a dead issue for much of the 1980s. Another consequence of the failure of the Meech Lake Accord was the formation of the Bloc Québécois (BQ), a sovereignist federal political party, under the leadership of the charismatic former Progressive Conservative federal cabinet minister Lucien Bouchard. Several PC and Liberal members of the federal parliament left their parties to form the BQ. For the first time, the PQ supported pro-sovereigntist forces running in federal elections; during his lifetime Lévesque had always opposed such a move. The Union Populaire had nominated candidates in the 1979 and 1980 federal elections, and the Parti nationaliste du Québec had nominated candidates in the 1984 election, but neither of these parties enjoyed the official support of the PQ; nor did they enjoy significant public support among Quebecers. In the 1993 federal election, which featured the collapse of Progressive Conservative Party support, the BQ won enough seats in Parliament to become Her Majesty's Loyal Opposition in the House of Commons. At the Royal Commission on the Future of Quebec (also known as the Outaouais Commission) in 1995, the Marxist-Leninist Party of Canada made a presentation in which the party leader, Hardial Bains, recommended to the committee that Quebec declare itself as an independent republic. Parizeau promptly advised the Lieutenant Governor to call a new referendum. The 1995 referendum question differed from the 1980 question in that the negotiation of an association with Canada was now optional. The open-ended wording of the question resulted in significant confusion, particularly amongst the 'Yes' side, as to what exactly they were voting for. This was a primary motivator for the creation of the 'Clarity Act' (see below). The Parti Québécois won re-election in the 1998 election despite losing the popular vote to Jean Charest and the Quebec Liberals. In the number of seats won by both sides, the election was almost a clone of the previous 1994 election. However, public support for sovereignty remained too low for the PQ to consider holding a second referendum during their second term. Meanwhile, the federal government passed the Clarity Act to govern the wording of any future referendum questions and the conditions under which a vote for sovereignty would be recognized as legitimate. Federal Liberal politicians stated that the ambiguous wording of the 1995 referendum question was the primary impetus in the bill's drafting. In 1999, the Parliament of Canada, at the urging of Prime Minister Jean Chrétien, passed the Clarity Act, a law that, amongst other things, set out the conditions under which the Crown-in-Council would recognize a vote by any province to leave Canada. It required a majority of eligible voters for a vote to trigger secession talks, not merely a plurality of votes. In addition the act requires a clear question of secession to initiate secession talks. Controversially, the act gave the House of Commons the power to decide whether a proposed referendum question was considered clear, and allowed it to decide whether a clear majority has expressed itself in any referendum. It is widely considered by sovereignists as an illegitimate piece of legislation, who asserted that Quebec alone had the right to determine its terms of secession. However the Supreme Court of Canada disagreed when the matter was referred to that body, ruling that the Act is constitutional and, just as Canada is divisible, so is Quebec, a ruling that has significant implications for linguistic and ethnic minorities within Quebec, the bulk of whom have traditionally opposed secession. Chrétien considered the legislation among his most significant accomplishments. In the 2003 election, the PQ lost power to the Liberal Party. However, in early 2004, the Liberal government of Paul Martin had proved to be unpopular, and that, combined with the federal Liberal Party sponsorship scandal, contributed to a resurgence of the BQ. In the 2004 federal elections, the Bloc Québécois won 54 of Quebec's 75 seats in the House of Commons, compared to 33 previously. However, in the 2006 federal elections the BQ lost three seats and in the 2008 federal elections lost two additional seats, bringing their total down to 49, but was still the most popular federal party in Quebec up until the 2011 Canadian federal election, when the BQ was devastated by the federalist NDP, with the Bloc at a total of four seats and the loss of official party status in the Commons (compared to the NDP's 59 seats, Conservatives' five seats, and the Liberals' seven seats in Quebec). Polling data by Angus Reid in June 2009 showed the support for Quebec separation was very weak at the time and separatism unlikely to occur in the near future. Polling data showed that 32% of Quebecers believe that Quebec had enough sovereignty and should remain part of Canada, 28% thought they should separate, and 30% say they believe that Quebec does need greater sovereignty but should remain part of Canada. However the poll did reveal that a majority (79%) of Quebecers still desired to achieve more autonomy. The number one area of autonomy that those polled had hoped for was with regard to culture at 34%, the next highest areas of autonomy cherished were the economy at 32%, taxation at 26%, and immigration and the environment at 15% each. 2011 was considered a watershed year for the sovereignist movement. In the aftermath of the 2011 federal election, Léger Marketing and pro-sovereignist newspaper Le Devoir conducted a poll on the question. When asked whether they would vote Yes or No in the event of a referendum, 41% of the respondents said they would vote Yes. In 2011, the sovereignist movement splintered, with several new parties being formed by disaffected politicians, with some politicians dissatisfied with slow progress towards independence, and others hoping to put the sovereignty question on the backburner. Leadership by PQ leader Pauline Marois was divisive. The separatist movement draws from the left and right spectrum; a sizeable minority of more conservative Quebecers supporting the PQ's political agenda because of the sovereignty issue, despite reservations about its social democratic political agenda. Right and Left must be interpreted within the provincial context; Liberal Party politics generally coincide with those of other liberal parties, while PQ politics are more social democratic in orientation. There is no mass conservative movement in Quebec's political culture on the provincial level, due notably to strong government interventionism and Keynesianism shared by all parties since the 1960s (the so-called "Quebec Consensus" since the Quiet Revolution), and the province's Catholic heritage. Sovereignty has very little support among Quebec Anglophones, immigrant communities, and aboriginal First Nations. About 60% of Francophones voted "Yes" in 1995, and with the exception of weak "Yes" support from Haitian, Arab and Latin American communities, most non-Francophones massively voted "No" (see Demolinguistics of Quebec). The opponents of the sovereignty movement view the project as ethnically exclusive, based on its rejection by non-Francophones. This position is sometimes disputed by the PQ, which claims its goal is all-embracing and essentially civic in nature. There is an undercurrent of feeling amongst "ethnic" and "anglo" voters that sometimes surfaces as a desire to separate from Quebec. This would create a new province of Canada, from the southwestern and southern portions of the province (comprising half of Montreal, parts of the Outaouais, the Eastern Townships). This feeling is exemplified by the statement — "If Canada is divisible, then so is Quebec" made by federalists in 1995 or "If Quebec can separate from Canada, then we can separate from Quebec". In contemporary times most mainstream political parties in Quebec deny or refuse to comment on the idea that Quebec can be divided up. During the 2007 Quebec election, federalist and Liberal Party of Quebec leader Jean Charest said that "All of these things are hypothetical questions...I do not think that Quebec is divisible. And if ever we were to go there, and end up in that situation, I know the question would be asked." 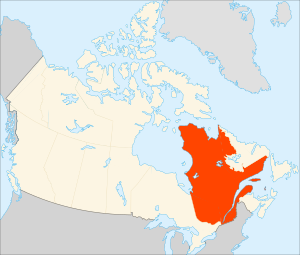 There was a feeling amongst the Cree of Northern Quebec, that should the province separate, they would remain part of Canada, and would force the province to return to its pre-1912 boundaries, and re-establish the Ungava district of the Northwest Territories, or a new territory or province created in its place. The other nine provinces of Canada have generally been opposed to Quebec sovereignty. Aside from marginal movements, the only major secessionist movement in English Canada has been the Maritimes Anti-Confederation movement immediately after Confederation occurred. In France, although openness and support is found on both sides of the political spectrum, the French political right has traditionally been warmer to sovereignists (like President Charles de Gaulle, who shouted his support of independence in Montreal in 1967) than the French left (like former President François Mitterrand). This used to be a paradoxical phenomenon because of the Parti Québécois and most sovereignists being to the political left and supporters of Quebec remaining a province tend to be politically on the right. Michel Rocard (who became Prime Minister of the French Republic) has been one of the French Socialists that broke that so-called rule the most, maintaining a close and warm relationship with Quebec sovereignists. More recently, Ségolène Royal, a leader of the French Socialist Party, indicated support for "Quebec sovereignty" but it was seemingly a reflexive answer to an "out of the blue" question from a Quebec journalist in Paris. On a later visit to Quebec City she gave a more nuanced position, mentioning a Parliamentary motion recognizing the Québécois as a "nation", but also describing 400 years of "oppression" and resistance of francophones in Canada. Former French President Nicolas Sarkozy has stated on the record that he opposes the separation of Quebec from Canada. This changed back to the view of the French Foreign Office under Sarkozy's successor, François Hollande. Richard Rohmer's novel Separation (1976) was turned into a TV-movie for CTV Television in 1977. In the movie, the Parti Québécois has formed the government of Quebec but Premier Gaston Belisle has repeatedly put off its promise to hold a referendum. International politics forces Belisle's hand. In the mid-1980s, a second movie, Quebec-Canada 1995, depicts a meeting between the president of Quebec and the prime minister of Canada to discuss a crisis involving Quebec military occupations of parts of Ontario and New Brunswick. Canada's armed forces are stretched thin with peacekeepers in such varied places as the Falkland Islands (with "Lady Goosegreen" being Margaret Thatcher). William Weintraub's satirical 1979 novel The Underdogs provoked controversy by imagining a future Quebec in which English-speakers were an oppressed minority, complete with a violent resistance movement. One planned stage version was cancelled before its premiere. Clive Cussler's 1984 novel Night Probe! is set against a fictional attempt at secession in the late 1980s. Rights to newly discovered oil resources in Ungava Bay, discovered as Quebec moves to secede, clash with the ramifications of a rediscovered secret treaty negotiated between the U.K. and U.S. governments during World War I.
David Foster Wallace's novel Infinite Jest includes both real and fictional Québécois separatist movements as integral to the plot. In the story, the United States has merged with Canada and Mexico to form the Organization of North American Nations (ONAN). Wheelchair-bound Quebec separatists use a video so entertaining it leads to death to accomplish their goals of both Quebec independence and the end of the ONAN. In the Southern Victory Series of alternate history novels by Harry Turtledove, Quebec becomes a separate nation during the First Great War (an alternative World War I), in which the United States defeats Canada, the United Kingdom and the other Entente Powers (including the Confederate States of America); upon its founding, the Republic is officially recognised only by the United States, Germany, Austria-Hungary, Bulgaria, the Ottoman Empire, Poland, Ukraine, Italy and the Netherlands. Since the United States organized this separation to weaken Anglophone Canada (and the UK by extension) and to aid in the post-war occupation of Canada, the Republic of Quebec operated as a client state of the United States, rather than being truly independent. This is later demonstrated in the series when Québécois soldiers release their US counterparts from occupation duties in Canada during the Second Great War, allowing the United States to focus its military efforts against the Confederacy. The Republic of Quebec in this alternate timeline is in a similar geopolitical situation to the Kingdom of Poland, a German puppet state created as part of Mitteleuropa. In DC Comics, the villain (and sometimes hero) Plastique is initially a Québécois freedom fighter, who resorts to acts of terrorism. In Marvel Comics, the superhero Northstar was part of the Front de libération du Québec (FLQ) in his youth. In Axis Powers Hetalia, Canada's nightmare features an independent Quebec. In the novel Babylon Babies by the French-born Canadian cyberpunk writer Maurice Dantec, loosely adapted as the film Babylon A.D., Quebec is independent and referred to as the "Free Province of Quebec". In Peter Watts' science fiction series, starting with Starfish, Quebec has attained sovereignty and is an energetic/economic superpower within North America. In the alternate history novel The Two Georges, co-authored by Richard Dreyfuss and Harry Turtledove, the American Revolution never occurs, resulting in the creation of the North American Union, a dominion of the British Empire. En route to the Six Nations, Thomas Bushell and Samuel Stanley of the Royal American Mounted Police discuss the nearby province of Quebec. Stanley muses that, being culturally French, the Québécois people would want to split off from the N.A.U. to become part of the Franco-Spanish Holy Alliance. In the Simpsons episode Homer to the Max, Homer Simpson is invited to an exclusive garden party by Trent Steel, a successful businessman whom he meets as a result of changing his name to Max Power. President Bill Clinton, a guest at the garden party, is called away to deal with Quebec 'getting the bomb'. In The Critic episode L.A. Jay, in a dream sequence, Jay Sherman, at his Oscar acceptance speech says he supports independence for Quebec, cutting to a room of Québécois saying "Viva la Sherman! Viva la Quebec!" ^ Alexander Panetta (September 5, 2012). "Parti Québécois wins Quebec election 2012". National Post. Retrieved September 5, 2012. ^ Rita Devlin Marier, New Quebec government could have problems over tax hike plans, Reuters, September 25, 2012. ^ "Statistics on Official Languages in Quebec". Office of the Commissioner of Official Languages. ^ "Pourquoi faire la souveraineté?" (in French). Retrieved September 22, 2010. ^ "Canada". Berkley Center for Religion, Peace, and World Affairs. Retrieved December 13, 2011. ^ "Trudeau promises a renewed Confederation". CBC Digital Archives. ^ Webber, Jeremy (1997). "The Legality of a Unilateral Declaration of Independence under Canadian Law" (PDF). The McGill Law Journal. Montreal: McGill University. 42 (2): 288. Archived from the original (PDF) on July 6, 2011. Retrieved March 3, 2011. ^ "?". Archived from the original on March 25, 2006. ^ "Parti Québécois first elected 35 years ago today". November 15, 2011. Retrieved October 25, 2017. ^ "I'm voting" (in French). Le Directeur Général des Elections du Québec. September 13, 2010. Retrieved September 22, 2010. ^ "I'm voting" (PDF). Le Directeur Général des Elections du Québec. September 13, 2010. Retrieved September 22, 2010. ^ a b c d e "Separation from Canada Unlikely for a Majority of Quebecers". Angus Reid. June 9, 2009. Retrieved November 7, 2010. ^ Dutrisac, Robert (March 14, 2011). "Sondage Léger Marketing-Le Devoir - L'appui à la souveraineté ne fléchit pas". Le Devoir. Retrieved March 24, 2011. ^ "New Movement For Quebec: Prominent Sovereigntists Publish Manifesto, Slam PQ As Spent Force". August 16, 2011. Retrieved October 25, 2017. ^ a b "Partition splits Quebec leaders". CBC News. March 7, 2007. Retrieved January 21, 2016. ^ Les Perreaux (November 28, 2006). "Canadians and Liberals reject Quebec nationhood: poll". Canada.com. Retrieved January 23, 2007. ^ "Sarkozy répudie le "ni-ni" sans ambiguïté" (in French). Le Devoir. February 3, 2009. Retrieved July 2, 2010. ^ "Sarkozy's sovereignty comments spark anger in Quebec". National Post. February 2, 2009. Retrieved November 8, 2010. The Question of Separatism: Quebec and the Struggle over Sovereignty by Jane Jacobs .